I have been on a major oatmeal kick lately. It has been my breakfast of choice for the last several weeks. This morning I decided to make oatmeal for me and the kids. I usually throw in frozen berries for Miller. The berries cool the oatmeal down and Miller loves blueberries. Harper just prefers brown sugar. In an effort to change things up and serve the same thing to everyone, I came up with this recipe. I served it with a side of walnuts and chocolate chips. I thought the kids would enjoy adding the goodies and mixing it all up. Bring the water and milk to a boil. Add the oatmeal and reduce heat a little. Cook for about 4 minutes or until the oatmeal begins to thicken. Add the sliced banana. 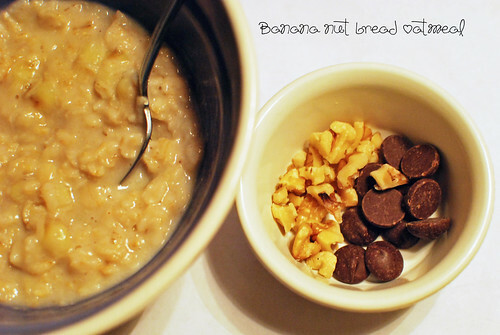 Mix until the banana incorporates into the oatmeal. Add the cinnamon and vanilla. Remove from heat and let sit for a few minutes. Add the walnuts and chocolate chips. yummm! we have been doing oatmeal a lot, too. i love crockpot overnight oatmeal! That looks soooo yummy! I never have enough time for breakfast in the morning. Thankfully, daycare feeds the kids. Maybe a weekend morning I will have to give it a try. Thanks for the recipe! yummm....this sounds awesome! I need to try this!